James McPake took a step back to take a huge leap forward in his career, one which transformed a young, raw striker into one of the SPL’s most formidable defenders. The change in roles has been remarkable but, throughout, one attribute has remained the same, a never-say-die attitude which has won the former Livingston and Coventry City stopper a whole new army of supporters at Easter Road. Hibs boss Pat Fenlon is in no doubt as to the 28-year-old’s leadership qualities, handing him the captain’s armband on his arrival on loan from the Ricoh Arena in January, retaining his faith despite a red card against Rangers on his debut and making him skipper again on his return to Edinburgh, this time on a two-year deal. Fenlon intends building his new-look side around the rock that is McPake, the Irishman promising further signings to add to those of Tim Clancy and Paul Cairney, who have already joined his summer revolution. But today former Hibs star Stuart Lovell revealed how McPake might have struggled to achieve the ionic status conferred on him on the east side of Edinburgh as he recalled the youngster’s early days trying to cut it as a striker with Livi. The ex-Lions captain said: “We had a good crop of young lads at Livingston at that time, guys like Robert Snodgrass, Graham Dorrans, Murray Davidson and the like. “We also had good senior players around, guys they could learn from and who could show them the correct path to take. It’s actually quite amazing to look around and see how many have gone on to forge good careers for themselves in the professional ranks. “James was relatively quiet, someone who kept himself to himself but he was one of those lads you really wanted to see go on and do well for himself as he has. 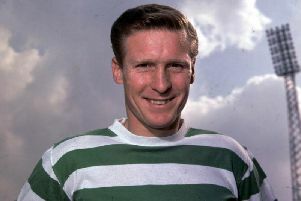 “He was very much a marauding striker although he had very much the qualities he has now as a centre half, aggressive, with a good spring and a never-say-die attitude. That’s what stood out back then. “He was a real grafter, total effort and commitment in every game and a good player to have in your side when the game got gritty. While McPake himself has mused as to whether he’d have “made it” as a frontman, Lovell believes he’d have found a place in the professional game but questions whether he’d have played in the English Championship and, now, in the SPL. The fact McPake has done so, turning in performances which persuaded new Northern Ireland manager Michael O’Neill to hand him his first cap, came after making the transformation from back to front, returning from a loan spell at Morton where he had played centre- forward. Lovell said: “It’s always interesting in football that different coach can sometimes see different things in a player and I can’t say I’d have seen that in James. “Playing centre half is a very different position from playing up front. At the back, everything is in front of your whereas strikers are running the channels and receiving the ball with their back to goal more often than not. “That said, there’s probably a similarity in being able to attack the ball, an aerial bombardment as a target man and a centre-half clearing his lines. Clearly moving back has been the making of James. When, as Hibs had to do a lot last season, you are on the back foot, you need someone who hold the players around him, hold a line, win the ball in the air and make their tackles. “Hibs probably haven’t had a dominant centre-half like that since big Rob Jones. Coincidentally it was a former Hibs defender who helped McPake make the transition, the youngster lining up between Steven Tweed and right back Dave Mackay, now at St Johnstone. Tweed today recalled his “baby-sitting”, saying: “James was a great boy, he listened to everything, he was totally receptive. “He’d been out on loan at Morton as a centre-forward but we had a fair complement of forwards so perhaps it was a matter of logistics that found him moving back.